"This is only the beginning." Sony has finally debuted the first official trailer for Will Gluck's Peter Rabbit movie, a hybrid CGI family comedy about the lovable rabbit rascal who messes with Mr. McGregor. Peter Rabbit is voiced by James Corden, and the triplets Flopsy, Mopsy, and Cottontail, are voiced by Margot Robbie, Elizabeth Debicki, and Daisy Ridley. The human cast includes Domhnall Gleeson as Mr. McGregor, plus Rose Byrne. This teaser trailer doesn't show much besides a bunch of animals partying inside of Mr. McGregor's house, which is kind of odd, but hopefully there's a good story to this rather than wacky humor left and right. Also, is it just me, or does Corden's voice not really fit Peter Rabbit? Have fun. Peter Rabbit, the mischievous and adventurous hero who has captivated generations of readers, now takes on the starring role of his own irreverent, contemporary comedy with attitude. In the film, Peter's feud with Mr. McGregor (Domhnall Gleeson) escalates to greater heights than ever before as they rival for the affections of the warm-hearted animal lover who lives next door (Rose Byrne). James Corden voices the character of Peter with playful spirit and wild charm. 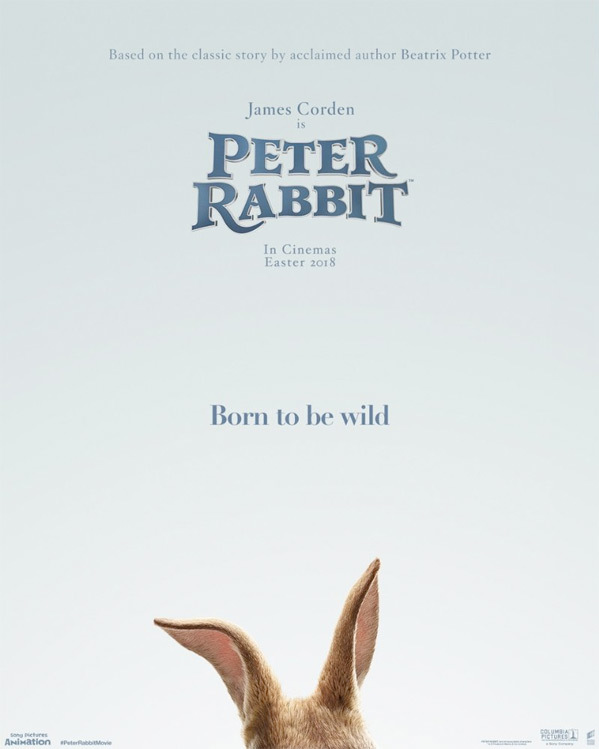 Peter Rabbit is directed by American filmmaker Will Gluck, of the films Fired Up!, Easy A, Friends with Benefits, and Annie previously. The screenplay is also written by Will Gluck, and Rob Lieber; based on the beloved books by Beatrix Potter. Sony will release Will Gluck's Peter Rabbit in theaters starting on February 9th, 2018 early next year. Who's up for this?